The photo id for this photograph is 92, in the Schools album. I think the boy on the top row, third from the left is my dad Les (Dennis) Rhodes. He was born 1920, so the photo must be around 1930. 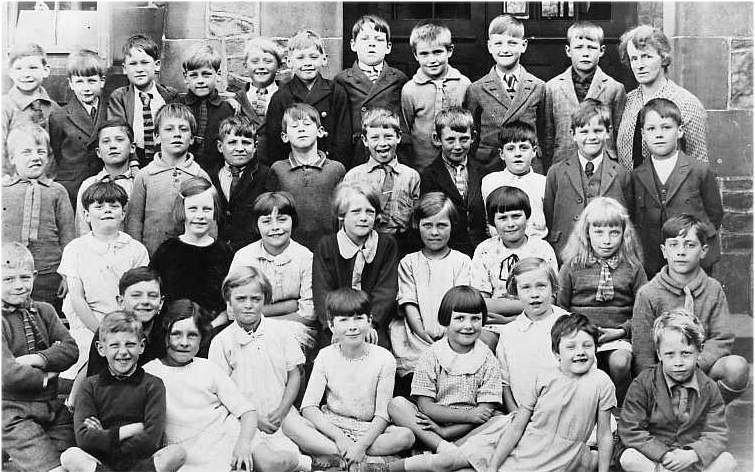 I think the little blonde boy near the front, on the left, with jumper, stripey tie and arms folded, is my Dad Bill Jones. I believe that the little girl, 2nd row from the front in the pale dress, arms folded, is Eileen Oscroft (married Doug Haig). Does anyone know if the lady teacher was called. Miss Kirk from Chapel? She taught me during 1947/1948 and retired shortly afterwards. Bottom far right. Harry Weate (my uncle) Father & Mother Abraham & Dora Weate. Harry had 2 sisters Elizabeth & Hilda. Abraham was Sunday school teacher @ Spring Bank for 54 years. 2nd row from the back, centre - little boy who is in shirt and tie (mouth open!) I think is Alan Collier. Life-long friend of my Dad, Bill Jones (bottom-left of photo), and I think was best man at his wedding. The teacher does look like Miss Kirk, a lovely teacher.